Saks Fifth Avenue is the premier name in NYC fashion, a Herald Square icon that is actually considered by many as the very ‘pillar of the New York Fashion Industry since 1924’. Sitting just blocks away from Radio City Hall, Times Square, and the Empire State Building, this iconic shopping stop was at first known as Saks and Company, until it united with Gimbel Brothers into this famous store that it is today, one of the most elegant retailers in the world. 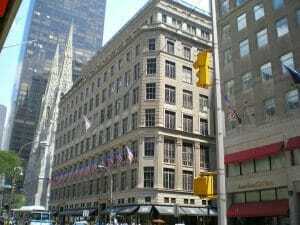 This is classic NY shopping, not to mention it is the brand's flagship location! You will get to experience luxury shopping like never before, truly the highest quality within the city, or so is said by many NYC locals. Don’t feel intimidated if the price range isn’t within your reach, just enjoy the chance to explore these designer men and women's clothing, jewelry, cosmetics, and accessories, each fitted with designer labels and a highly attentive service staff to boot. Browse the absolutely amazing selection or talk to a staff member about how to maintain a Louis Vuitton bag, or to spritz you with the latest designer smell. Enjoy spacious showrooms and marble floors reminiscent of classic Manhattan design as you see up close and personal exclusive trends and deluxe designer showrooms. This is NYC fashion at it’s finest!